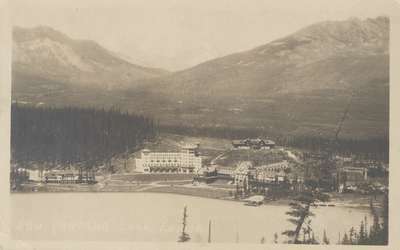 A postcard of Chateau Lake Louise, Alberta, to Rev. Robert B. Layton in Lacombe, Alberta, mailed from Fairmont Springs, B.C. "Lake Louise" was named in 1884 to honour Princess Louise Caroline Alberta, the fourth daughter of Queen Victoria, married to the Marquis of Lorne, Governor General of Canada at the time. The Canadian Pacific Railway began construction of the hotel in 1890. "Welcome, Bob and family to Alberta. We slept in your Manse for a night a week ago after our first day out. Are enjoying our trip immensely. Will reach Spokane in a couple of days. Hope you will find everything to your taste in your new home.